Appeared in 12 games for the Bombers in his second CFL season and registered 10 tackles on special teams. 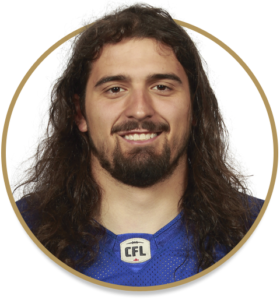 Played in nine games as a rookie after being selected in the fourth round, 28th overall, in the 2016 CFL Draft… Recorded seven special-teams tackles… Became a regular in the 44-man lineup by playing in the final seven regular season contests. Played four seasons with the Laval Rouge et Or, where he totaled 130 tackles… A two-time RSEQ All-Star, Gauthier earned CIS Second-Team All-Canadian honours as a senior.